Aprilia’s positive trend was confirmed once again under the chequered flag at Aragón. 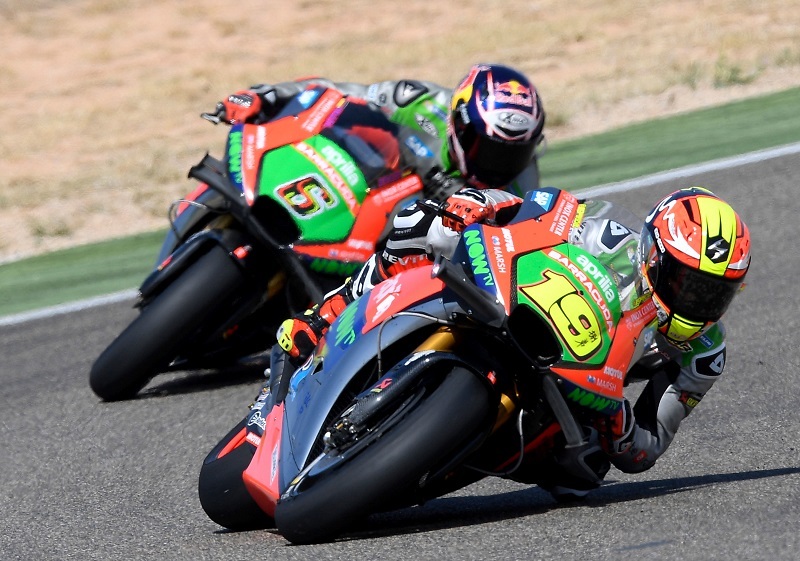 The RS-GP machines ridden by Alvaro Bautista and Stefan Bradl finished respectively in ninth and tenth place, with a gap behind the leader of just over 20 seconds for the Spaniard (23.071 for Bautista, 27.898 for Bradl). The race, where Bradl started from the twelfth spot on the grid and Alvaro from the fourteenth, began well straight away for the Aprilia Racing Team Gresini riders, moving up through the ranks in the initial phases. In the subsequent laps, Bautista and Bradl’s pace shown through, both skilfully maintaining interesting times while their direct rivals showed an increasingly marked drop in performance. During the seventh lap, Alvaro overtook his teammate, proceeding to hunt down the pair made up of Pol Espargaró and Andrea Dovizioso. He engaged in a heated battle with the rider from Forlì, coming out on top and moving into a nice ninth place. Behind him, Stefan Bradl continued his progress, finishing the race in tenth place. “A nice race, with two bikes in the top ten in a race without crashes. The gap behind the leader is the lowest we have ever achieved, and that is rather encouraging data. Technically, the trend is very good. It is clear both from the performance in all the practice sessions and from the atmosphere within the entire team, which understandably becomes “charged” when our potential gets interesting. We are on a positive note, but we must keep our feet on the ground. Our work is certainly not done yet, given our objectives. We need to improve on all fronts, but we are aware of our potential”. “Today we showed that a concrete step forward has been taken recently. We have grown and the gap behind the winner today shows it, the best since the beginning of the season. All this means that Aprilia is working hard and well and that the team is doing the best possible job. Alvaro and Stefan rode a great race, bringing home an excellent result for the team. We are beginning to achieve this type of result more and more compared with the past and this is another positive aspect. This performance is a great confidence booster and we needed it to keep working with even more determination”. “A good weekend for us, ending with a double top 10. I had good sensations in the saddle throughout all the practice sessions and we did a good job. The, in FP4, when I had a consistent pace even with used tyres, I realized that we could do well in the race. I battled with Hernandez and with Dovi, managing to overtake them, and I fell in behind Pol whose times were very similar to mine. We maintained a good pace and I saw that we continued to make up ground on the group that was battling for fifth place, but toward the end of the race I lost a bit of feeling with the rear tyre. In any case, ninth place is a great result for me and for Aprilia, considering Stefan’s performance as well. Since Misano we have definitely taken a step forward and I wish to thank the team and the guys who are hard at work at home. Now we will continue in this direction to finish the season well”.